Jirka is a type of a person that doesn’t like to sit idle. There is always something going on, and it tends to be unique. During last week’s trip to The Burren we were already discussing what to do following weekend. He told me about this mythical, unique place in co. Wicklow – Bell Rock. What’s so unique about it, you say? It is a bolted crag. Yes. You didn’t misread it. Bolts are used to protect the climber. In Ireland. There aren’t to many places like that in this country. I’d say you can count them on the fingers of one hand. And one of them is just a stone’s throw from where we live! All the details about location, approach and rock itself as well as the routes can be found on the climbing.ie wiki, so please go there to read more. 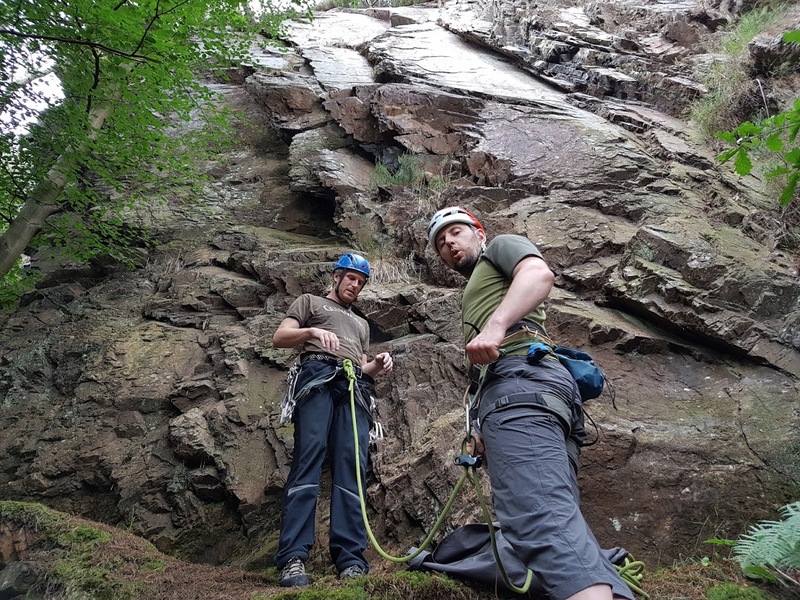 I’ll just add that the place is pretty much roadside, however bit sketchy in terms of moving around, so caution should be exercised (there is actually a fixed rope at the base of the crag to allow safe(er) traversing along the base). But even so, when it’s wet – it is very easy to slip there. Before I go on about our adventure, I’ll just say that I’m rather disappointed in the fact that the new Google Photos service (the descendant of Picassa) doesn’t actually offer photo embedding (that would allow me to link them here, directly to the blog). Because of that I have to change the way I write these blogs (or re-upload all the photos to other hosting server). I’ve chosen to write couple of words here and then send you, my reader directly to the album, where photos will have descriptions, hopefully giving you idea what’s what. Anyway – we weren’t planning on climbing much, and realistically speaking from 8 routes out there, we could only do maybe 3 (on a good day), so we decided to meet late, and do 1/2 day out there. It was a good idea, as it was raining most of the morning, pretty much all the way until we got there (around 1pm). The rock was pretty wet, approach sketchy, but sure it was a good fun. It’s not a place to go back to every week, but definitely something worth going to every now and then. I invite you now to check out the album here or by clicking on the above photo. Click on individual photos within the album for descriptions.